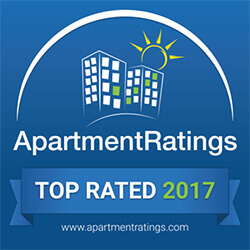 Top Rated awards recognize properties with outstanding resident satisfaction as measured on ApartmentRatings.com. Approximately 5% of the total properties listed on the site qualify for an award, making it an outstanding accomplishment! We’d like to congratulate the following communities on receiving the Top Rated Award! An affordable, green apartment community in Takoma Park, Washington, DC leases up in record time. Metro Village Apartments, located in Takoma, DC has completed a successful lease up. The five-story, mixed-income rental community is located adjacent to the Takoma Metro and in the midst of a vibrant DC neighborhood.